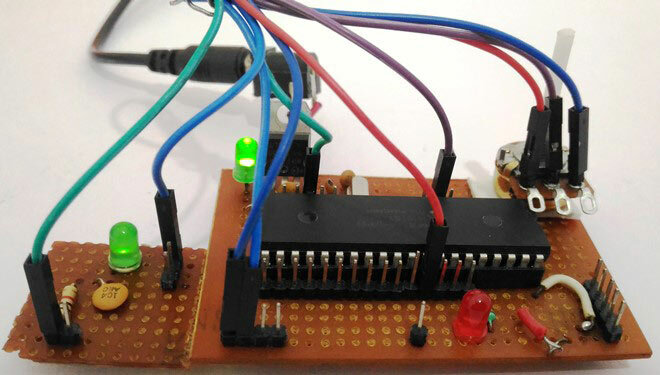 This is our 10th tutorial of Learning PIC microcontrollers using MPLAB and XC8. Till now, we have covered many basic tutorials like LED blinking with PIC, Timers in PIC, interfacing LCD, interfacing 7-segment, ADC using PIC etc. If you are an absolute beginner, then please visit the complete list of PIC tutorials here and start learning. In this tutorial, we will learn How to generate PWM signals using PIC PIC16F877A. Our PIC MCU has a special module called Compare Capture module (CCP) which can be used to generate PWM signals. Here, we will generate a PWM of 5 kHz with a variable duty cycle from 0% to 100%. To vary the duty cycle we are using a potentiometer, hence it is recommended to learn ADC tutorial before starting with PWM. PWM module also uses timers to set its frequency hence learn how to use timers beforehand here. Further, in this tutorial we will use a RC circuit and a LED to convert the PWM values to Analog voltage and use it for dimming the LED light. The frequency of a PWM signal determines how fast a PWM completes one period. One Period is complete ON and OFF of a PWM signal as shown in the above figure. In our tutorial we will set a frequency of 5KHz. PWM signals can be generated in our PIC Microcontroller by using the CCP (Compare Capture PWM) module. The resolution of our PWM signal is 10-bit, that is for a value of 0 there will be a duty cycle of 0% and for a value of 1024 (2^10) there be a duty cycle of 100%. There are two CCP modules in our PIC MCU (CCP1 And CCP2), this means we can generate two PWM signals on two different pins (pin 17 and 16) simultaneously, in our tutorial we are using CCP1 to generate PWM signals on pin 17. In our program we will read an Analog voltage of 0-5v from a potentiometer and map it to 0-1024 using our ADC module. Then we generate a PWM signal with frequency 5000Hz and vary its duty cycle based on the input Analog voltage. That is 0-1024 will be converted to 0%-100% Duty cycle. This tutorial assumes that you have already learnt to use ADC in PIC if not, read it from here, because we will skip details about it in this tutorial. So, once the configuration bits are set and program is written to read an Analog value, we can proceed with PWM. Make the CCP1 pin an output by clearing the TRISC<2> bit. There are two important functions in this program to generate PWM signals. One is the PWM_Initialize() function which will initialize the registers required to set up PWM module and then set the frequency at which the PWM should operate, the other function is the PWM_Duty() function which will set the duty cycle of the PWM signal in the required registers. The above function is the PWM initialize function, in this function The CCP1 module is set to use PWM by making the bit CCP1M3 and CCP1M2 as high. The timer module’s prescaler is set by making the bit T2CKPS0 as high and T2CKPS1 as low the bit TMR2ON is set to start the timer. Once the frequency is set this function need not be called again unless and until we need to change the frequency again. In our tutorial I have assigned PWM_freq = 5000; so that we can get a 5 KHz operating frequency for our PWM signal. Our PWM signal has 10-bit resolution hence this value cannot be stored in a single register since our PIC has only 8-bit data lines. So we have use to other two bits of CCP1CON<5:4> (CCP1X and CCP1Y) to store the last two LSB and then store the remaining 8 bits in the CCPR1L Register. We also know that Tosc = (1/PWM_freq), hence..
You can check the complete program in the Code section below along with the detailed Video. As usual let us verify the output using Proteus simulation. The Circuit Diagram is shown below. Connect a potentiometer to 7th pin to feed in a voltage of 0-5. CCP1 module is with pin 17 (RC2), here the PWM will be generated which can be verified using the Digital oscilloscope. Further to convert this into a variable voltage we have used a RC-filter and an LED to verify the output without a scope. An RC filter or a Low pass filter is a simple circuit with two passive elements namely the resistor and the capacitor. These two components are used to filter the frequency of our PWM signal and make it a variable DC voltage. If we examine the circuit, when a variable voltage is applied to the input of R, the capacitor C will begin to charge. Now based on the value of the capacitor, the capacitor will take some time to get fully charged, once charged it will block the DC current (Remember capacitors block DC but allows AC) hence the input DC voltage will appear across the output. The high frequency PWM (AC signal) will be grounded through the capacitor. Thus a pure DC is obtained across the capacitor. A value of 1000Ohm and 1uf was found to be appropriate for this project. Calculating the values of R and C involves circuit analysis using transfer function, which is out of scope of this tutorial. The output of the program can be verified using the Digital Oscilloscope as shown below, vary the Potentiometer and the Duty cycle of the PWM should change. We can also notice the output voltage of the RC circuit using the Voltmeter. If everything is working as expected we can proceed with our hardware. Further check the Video at the end for full process. The hardware setup of the project is very simple, we are just going to reuse our PIC Perf board shown below. We will also need a potentiometer to feed in the analog voltage, I have attached some female end wires to my pot (shown below) so that we can directly connect them to the PIC Perf board. We can use simple female to female connecting wires and connect them according to the schematics shown above. Once the connection is done, upload the program to the PIC using our pickit3 and you should be able to get a variable voltage based on the input of your potentiometer. The variable output is used to control the brightness of the LED here. I used my multimeter to measure the variable outputs, we can also notice the brightness of the LED getting changed for different voltage levels. That’s it we have programmed to read the Analog voltage from the POT and convert into PWM signals which in turn have been converted into Variable voltage using RC filter and the result is verified using our hardware. If you have some doubt or get stuck somewhere kindly use the comment section below, we will be happy to help you out. The complete working is working in the video. Kindly explain your requirements in detail, we will be happy to help you out!! Thanks Arkan, your comments encourage us..
What are CCP1X and CCP1Y? What is their role? As you can see the variable duty contains the value of the PWM duty cycle. This va;ue has to be used to set the CCP1X and CCP1Y bit and also the CCPR1L register. Since the Registers in our PIC MCU can hold only upto 8-bits(PIC16F877A is a 8-bit MCU) the additional two bits (CCP1X and CCP1Y) are used to store the least two significant bits and the remaining 8 bits are stored into the CCPR1L register. But to get the 0th bit in CCP1Y, duty should be done '& (AND)' with '1' right? and for getting 1st bit in CCP1X duty should be done '&' with '2' right? instead of the other way done above. I checked your code for my project and it worked well. now the problem is only the led is dimming but the fan or bulb doesn't dimming. Help me in this. I am not sure how you have interfaced the fan or bulb with the PIC MCU. Let me know what your driver circuit is. If you have used a relay it will not work. Hence make sure you use a power electronic device like MOSFET and you switch it properly using the PWM signals. the timer0 in PIC18F is used to get 13ms delay. can u show steps to get the value of T0CON based on TMROH=0x02 and TMROL=0x12 and Fosc=20MHz. hello! please from ''duty = ((float)duty/1023)*(_XTAL_FREQ/(PWM_freq*TMR2PRESCALE)); ''' what is ''float'' doing in there? is it a variable or what?? why did you hav to add float to the formulae?? No Float is not a variable. Here the data type of duty is integer. So when this integer value is devided by 1023 it will also be an integer. But we need it in terms of decimal for better accuracy. So we prefix (float) to ask the compilernot to truncate the obtained result to interger but keep it in float as such. Yes you got it partially correct. But, the value 0.9971 will not be converted to 0 yet. Because we still have the remaning formulae to complete. wow!! Thanks ... confusion cleared! Interface a keyboard with microcontroller and read the entered values. Then write that value to PWM_duty() function. This way you should be able to control the Servo motor based on your entered value. iam intersted this pwm generating ckt. first of all i thanks you lot about this tutorials . can you help me how to modify this ckt instead of pot. make it digital through Up & Down push buttons.... is it possible? This code is very helpful to get the basic idea for coding for a pwm output. Can you guide me to design a pwm output for pic16f18857. I am using a PIC16F873A with a variation of your code that uses a for() loop to increase and decrease the duty cycle. I am using a LED component that effectively has RGB LED's, connected to PORTC 1, 2, and 3. Is there any way of changing which pin the pwm signal outputs on? have tried altering the TRISC2=0 to TRIS1=0 etc to no avail. is it possible to output the signal on multiple pins at the same time? Never have I used PWM signals before so it's kinda tricky to me. I am using PIC18F8722 and am supposed to build a function with the following structure : void config_PWM(int en, int ch, int freq, int period, int c_duty) . //en=enable the module, ch=PWM output channel, freq=osc. freq., period=PWM period(0-127), c_duty=cycle duty(0-1024) . All the information here has been really helpful, I am just having difficulties in putting all this stuff together within one function. If you could please land me a hand I would be very grateful, since I won't have access to the microcontroller til next week. Thank you! If I may ask, why is the signal from the potentiometer being fed to both RA0 and RA5 ? Ur ckt and code working fine for led only ang it also getting dimmed. But even after adding a TRIAC the bulb/ fan not getting on. Please suggest? Can you please tell me how to generate two symmetric PWM pulses at RC1 and RC2 ports (pic16f877a). Dead time between two pulses also makes me headache. Sir can you tell me what will be the possible changes in the code if I use a 4Mhz crystal for generating a PWM frequency of 250hz?